MOB’s first live tour took place in Kobe and Makuhari in June and July. I arrived in Kobe a day early so I could line up for goods. Took the first train on the Port Liner to arrive at around 6AM and already there was a sizable line. Obviously these were people who were staying at the hotel near the venue. (I didn’t stay there because there is absolutely nothing in the way of food, convenience stores, etc. in the area.) Apparently there was a high school swimming tournament at the venue next door so there were a lot of students passing by. Their puzzled looks when they looked at the event schedule for World Hall were hilarious. Didn’t have any problems buying all the goods I wanted, though the line was pretty hot. Near the goods entrance were the present boxes and they had separate boxes for HIRO-C and Kamiya Hiroshi, and ONO-D and Ono Daisuke. XD After goods, my friend and I went back to our hotel to catch up on sleep. The set list for all four shows were the same, except the guests were different for Kobe and Makuhari. At Kobe it was Miyake Hirofumi (aka Hiropon, whom you have probably seen as the bassist at OrePara), and at Makuhari it was Oka Naoki. The corners were also the same but with different contents. The videos shown were all the same too, though I was hoping they would be different. Before the event, they plays songs that were sung at karaoke for OnoD’s birthday episode such as JoJo, FLYING IN THE SKY, Dragon Night, Guren no Yumiya, etc. The audience got really pumped up just listening to the songs. Finally when the lights went down, there was a video played on the monitor with the band members explaining what they thought “rock” is. After, each of the band members were called up onto the stage with the announcements recorded by Lenne Hardt (American seiyuu affiliated with Aoni Production). While the back band came onto the stage from the side, HIRO-C and ONO-D came from below via a pop up mechanism on the stage. After the live reading, one of the back band members would exclaim that they didn’t join the band to do live readings. It was Chanko on the first day, then Yagihashi, UchiP, and Suwa san on the last day. The rest of the band would then have to convince them to change their mind or else MOB would have to disband. Each day, they would search the audience to find someone who fit a description given by the member who was leaving. Except for Chanko who was left on stage because he’s heavy, the band rode carts around the venue throwing color balls with an email address written on it. My friend actually got one the first day in Kobe. In the end the band member would be satisfied and take back their decision to leave the band. After, they sang Otoko Rhapsody, but changed it to “Rock Rhapsody” and the parts where each of them say a line (“When you’re as rock as me…”) was different each day. We learned that Yagihashi and Chanko’s parents were in the audience on the first day of Makuhari. After the video was the guest live by Kamiya Hiroshi and Ono Daisuke from DGS! They sang Glow My Way complete with dance choreography. I love when they dance! During their MC, they thanked MOB for inviting them as guests. ^^; After introducing the dancers (of course Toyo got the most cheers), they sang Tsumugi Ito. More dancing in this. So cool~! There was a special radio corner afterward. It was interesting to see Kamiya and OnoD make eye contact to do the corner title call in unison. The content, except for the last part which would connect to the next song, was different each day. They read letters from listeners and did the Dear Girl Danwashitsu corner. One part that was hard to forget was when they were eating different famous foods from the Kobe area. They did the same thing that they did on the radio in the past where they would need to do a food report without saying any of the three words that the other person chose. During this, Kamiya ate chocolate and he did some major fan service by flicking his tongue in and out as if licking the chocolate. Think of Kakyoin’s “rerorero” from JoJo. You can imagine the screams. XDDD On the second day of Kobe they also had a kiss competition like they did on the show in the past. XD Um, yeah….. LoL. It was pretty hilarious and there was plenty of laughing and screaming. XD When the little jingle that’s usually played after commercials was played, OnoD would always knock his hand on his head and do a funny face at the end. Cute. X3 Lastly, they sang 30minutes Shootin’ Star. On the second day of Kobe, they must’ve had some technical difficulties because the music suddenly stopped after it started playing. Oops. ^^; At least it was before they started singing, I guess. Kamiya followed it up really well then saying that it was probably because the audience wasn’t cheering enough, and he made us cheer louder. More videos were played after the DGS corner. They included Cobraween, Dear Girl Smoothie, Kamiya Hiroshi Seitansai 2015, Kamiya Hiroshi & Tatebue kun no DGS, and Ono Daisuke Seitansai 2015 (karaoke!). After, MOB said that they found the answer to their question, “What is rock?” The concluded that the audience was rock, and then sang Ace of Asia. That was the last song before the encore. As people chanted “encore,” someone with a wrestling mask and cape came on stage claiming to be “Encoreman” and that they came on stage because they were being called. It was one of the band members. On the first day of Kobe, it was Suwa san and he karaoke’d JoJo -Sono Chi no Sadame-. On the second day it was Yagihashi singing STAND PROUD. For Makuhari, it was Chanko on the first day and he also sang JoJo -Sono Chi no Sadame-. The last day was UchiP who sang Guren no Yumiya. Then they had the real encore with MOB singing Say Your Name! 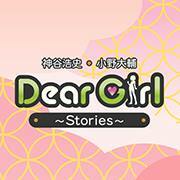 ~Dear Girl~. At the end they showed a video with photos from the DGS radio show with Kono Uta ga Togirenai You ni as the BGM. Overall, it was an amazing event. I’m really glad I got to go to all four performances. I had good seats in the arena for both days in Kobe, and while I had a stand seat for the first day of Makuhari, I was in the front row for the tour final! It was great! I can’t wait for the BD/DVD! I’m fairy sure they will include all the different contents from all four shows. Hopefully Chanko will be able to lose all that weight so MOB can make a comeback!